Hello i just wanted to say that I am very pleased with this product and that it has gone beyond my expectations." How does laser light stimulate thicker, fuller hair? Truth is, the exact mechanism behind laser hair therapy is not known. There are several different theories about why lasers work as a thinning hair treatment. Here's what's been suggested. This theory says that the laser energy is simply absorbed by the hair follicle, and this stimulates thicker, fuller hair. Basically it says you're absorbing light energy into the scalp, thus causing the hair to become thicker. It's thought to be similar to a plant growing by absorbing sunlight. Laser light has unique properties that make it different from regular light. No light bulb or LED puts out light that share these properties. Coherent means that the light waves are all of the same wavelength, and that they are in phase with each other. Have a look at the following, which shows how regular light looks. Regular light is made of many different wavelengths, and many of the waves cross each other, and tend to cancel each other out. It loses energy quickly. If you double the distance from point A to point B, only one quarter as much light reaches point B. Now let's consider light that is all one wavelength. This can be accomplished in several ways, most commonly by filtering out unwanted wavelengths. Colored lights on a Christmas tree would be an example. Regular light is produced, but red glass filters out everything but red light. Now we can see what makes laser light so special. Being coherent means that the waves themselves are "in-phase," meaning that they travel together and do not cancel each other out. Collimated simply means that the light is focused, and does not spread out. This is why a laser sight results in a small dot on a target whether near or far. These properties of laser light make it different than regular light. And yes, we sell only lasers, never LEDs. One theory of why lasers work so well is that they may be stimulating blood flow around the hair follicle, flushing out the DHT, thus letting the hair resume normal activity. While this may be part of the reason, it is not a complete answer. Lasers actually stimulate thicker, fuller hair, even when just shaved. 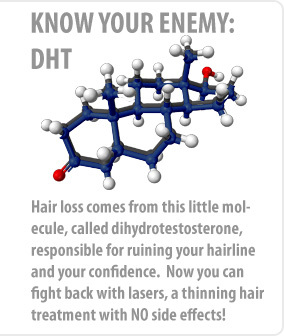 Shaving has nothing to do with DHT - and lasers still work. In fact, the effect that lasers have on hair was discovered completely by accident. It was in 1967, shortly after the first lasers were invented, that Endre Mester in Semmelweis University was doing experiments with lasers on skin cancer. He noticed that when applying lasers to the backs of shaven mice, the shaved hair grew back thicker and fuller in those mice in the treated group versus the untreated group. Since then, numerous experiments have shown that a certain exact wavelength of laser light - 650 nm (nanometers) - is most effective on thinning hair. This is the laser we use in all Super Grow Laser products. This simple observation sparked an entire industry, and gave people with thinning hair the first chance at a real solution. The laser light works on a person's own natural hair, right where it belongs. No dangerous drugs or surgery. However it works, we just know one thing for sure - IT DOES WORK ON THINNING HAIR - GIVING THICKER, FULLER HAIR. Don't worry if nobody knows why it works, just relax and let it do its job. The results are guaranteed so you have nothing to lose. While you are sitting in an ordinary room with usual light, the light is reaching maybe one sixteenth of an inch into your skin. This is a picture showing ONE of our powerful lasers - held about an inch from a finger. This single laser penetrates the entire finger, bathing the skin deep with therapeutic low level laser light. One laser is capable of completely surrounding every hair follicle with nourishing laser light for a radius of about an inch. The light goes past the follicle into the blood vessels underneath, reaching as deep as possible. With any overhead Super Grow Laser system you have AT LEAST FIFTY of these powerful lasers reaching deep into your scalp the entire time you use it. There's no way you can go wrong. You do not have to worry about underpowered handhelds. More lasers = faster results. Each powerful laser penetrates deep for maximum results. You can relax knowing that you are getting the most powerful home laser system on the market today.